Chris Gutierrez admits he still wants to get into acting like his lola Gloria Romero. As the grandson of Philippine showbiz veteran actors Gloria Romero and Juancho Gutierrez, it was only fitting for Chris Gutierrez to join showbiz when he was just 13 years old as part of Star Magic Circle Batch 13. His love team partner then was Zia Marquez and he was part of Star Magic's Astigs composed of Enchong Dee, Dino Imperial, Angelo Patrimonio and the late AJ Perez who also became his good friends even after he left showbiz to concentrate on his studies. “Some of them I've formed really good friendships with like Dino Imperial and Enchong Dee. We talk whenever we have the chance and catch up. We spent so much time together that we became really good friends,” he said in an exclusive interview with Push.com.ph. 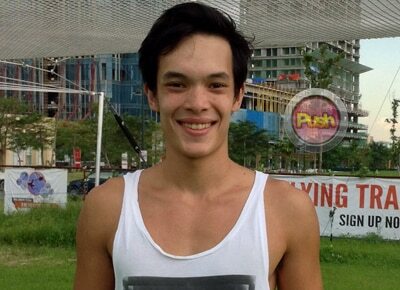 Chris admitted he did not want to prioritize showbiz when he was younger. Now at 22 years old, he has a culinary arts degree from the International School for Culinary Arts and Hotel Management in Quezon City. “I quit when I entered college. Kasi it took too much of my time. I graduated high school in 2010 and I was doing school for a long period of time so it gets really boring also and I wanted to do other things in life. But I'm not going away from showbiz. I get bored really easily so I like doing different things. With my culinary arts naman I was able to work for the Asian Food channel. I was able to work a bit in Aubergine for school kasi it's connected to my school. I was able to compete in a culinary cup and stuff like that so I did a bit. I'm going to come back to showbiz eventually. It's just that right now my ADHD is acting up and I need to do something else (laughs). I've been good. Healthy lifestyle all the time. I'm just here in BGC all the time and I try to do any sort of exercise possible. I get bored very easily so I can't just be sitting down,” he admitted. If given the chance to get into acting again, Chris said he would try harder to improve himself as an actor. “I don't know (about roles), I'm up for anything. I'll try anything. I never really was able to get good at that aspect. I could work on it more. I don't choose either,” he said. Despite his lineage, Chris said he does not take for granted having good acting genes. “I really have to work at everything, I think. A lot of people who are good at acting are also hardworking at it. I can't just go in there and take things for granted. I look up to my lola because of her work ethic. She's super professional. She's the first person on the set and the last person to leave. She memorizes everybody's lines,” he added. 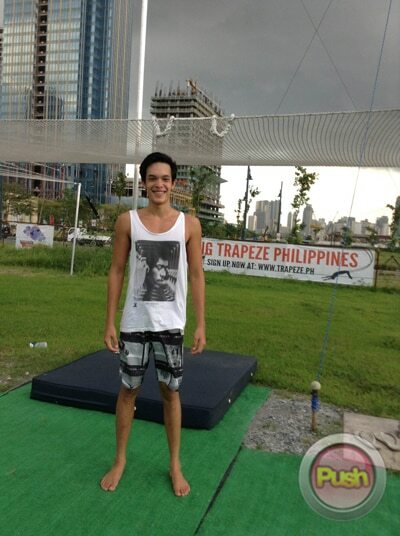 This year, Chris said he is enjoying his job as one of the instructors at the newly opened Flying Trapeze Philippines at the Bonifacio Global City grounds. 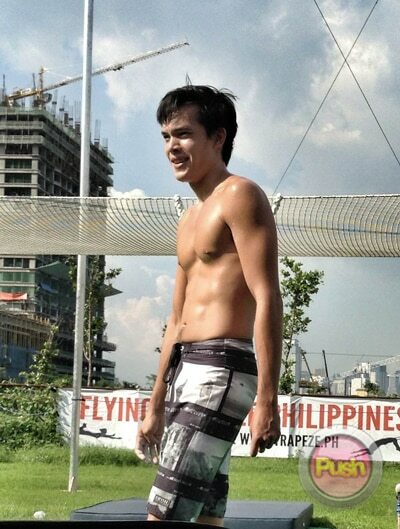 “I knew Will Hsu (the owner of Flying Trapeze Philippines) from before because we used to train in mixed martial arts together. I took it for a summer just to get in shape and stuff. I saw him post about this and he was looking for somebody to help out last June. I went here and then I tried it and he asked me if I would like to come back to work here. I'm teaching and learning also at the same time. We do this around six times a week for around six to 12 hours a day. So if you do anything that much you eventually get the hang of it,” he shares. The former Star Magic talent said there is nothing like the feeling of flying on the trapeze even if you are not a fan of Cirque du Soleil. His students range from ages six to 60 years old and it is always a different experience for everybody. “The thing is, I was scared of heights before I did this. So the first week that I was working here I was shaking the whole time and then I just got used to it. Now I'm just calm. I'm calm up there and it's a good way to exercise and keeps me being focused while you're scared (laughs). Now what I love most is the swinging part, the flying. It really feels like your flying. When you do it a lot, they allow you to take off the safety wires and when you confident in your swing and you take off your safety wires and it's a whole other feeling of like free fall, doing it over and over again, the adrenaline rush,” he explained. Chris said when he started with the trapeze he did not tell his lola Gloria Romero. “I didn't want her to get worried. I didn't tell her that I was doing this trapeze and then she just saw it on TV and she was like, 'Is that you?' (laughs). When she found out, she was very nervous but my lola is very encouraging in anything I do as long as it has hard work and she sees that I enjoy it a lot,” he said. Aside from trapeze Chris said he also enjoys doing yoga and working out in order to keep fit.